Seven of the 240 species of turtles on Earth are marine turtles. Marine turtles spend most of their life in the ocean and exist primarily in warm, tropical seas. 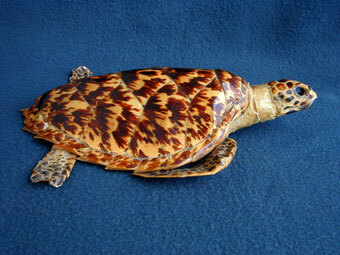 The marine turtles belong to two different families - the Dermochelyidae and the Cheloniidae. The Dermochelyidae family has only one living species, the leatherback turtle. The Cheloniidae family has six living marine turtle species - two Ridley turtles, a hawksbill turtle, a flatback turtle, a green turtle, and a loggerhead turtle. 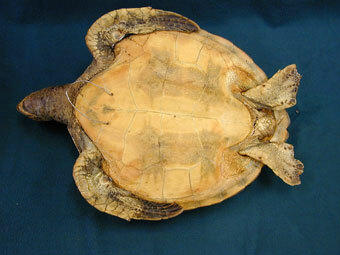 Turtles are air-breathing reptiles classed with snakes, lizards, alligators and crocodiles. They are grouped together in the taxonomic order called Chelonia (or Testudines). Turtles are cold-blooded and rely on the temperature of their surroundings to dictate the level of their metabolism. The warmer it gets, the higher their metabolic rate and the cooler it gets, the lower their metabolic rate. Most marine turtles live only in the tropics because polar and temperate ocean water is so cold that they cannot move fast enough to catch their prey or digest it properly. 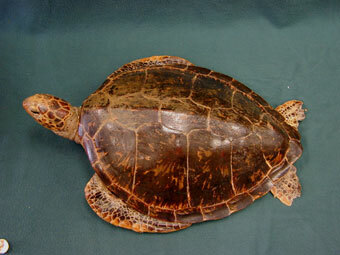 Turtles are the only reptiles with a shell. Many turtles can withdraw their head, tail and all four limbs inside their shell for protection but marine turtles cannot do this. Their extremities are always outside their shell. 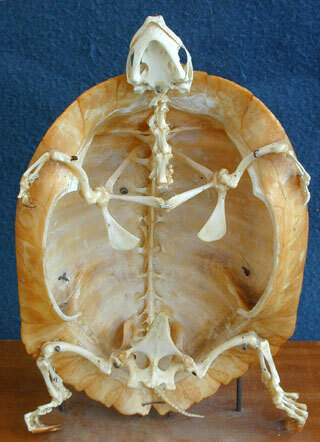 The backbone of the turtle is fused to their top shell as are their ribs. 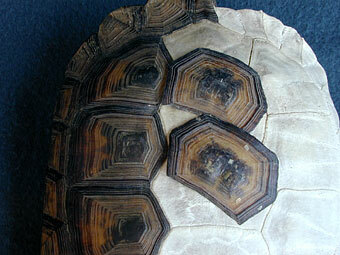 Turtle shells are made of two layers. The bottom layer is bony plates that are part of the skeleton. The top layer is formed from skin tissue and is a horny material called scutes. These layers are common on six of the seven marine turtles but the leatherback turtle has tough skin, and a reduced number of bony plates, rather than scutes. 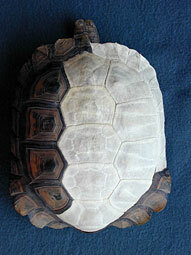 The domed top of the turtle shell is called the carapace. The bottom part is called the plastron. The carapace and plastron are fused along the edge by an area called 'the bridge' leaving openings for the head, forelimbs, hindlimbs, and tail. 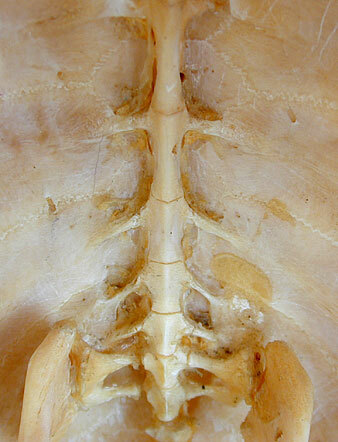 The number and arrangement of bony plates, on the carapace and plastron, can be used to determine each species. Marine turtles have flipper-shaped forelimbs and hindlimbs. These enable the marine turtles to swim with ease, making them the fastest of all the turtles (up to 36 miles per hour). On the other hand, they are very slow out of the water, their flippers are not at all suited for walking on land. Marine turtles rarely walk on land - only when they are babies moving from their nest to the ocean and then only adult females who come ashore to lay their eggs. 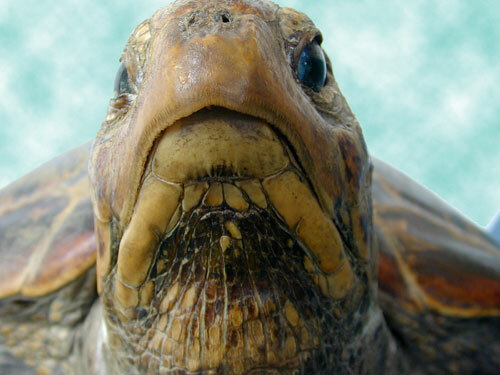 Turtle heads have a hard beak along with a pair of eyes and a pair of nostrils. They lack teeth but use the sharp edges of their beak for chewing. 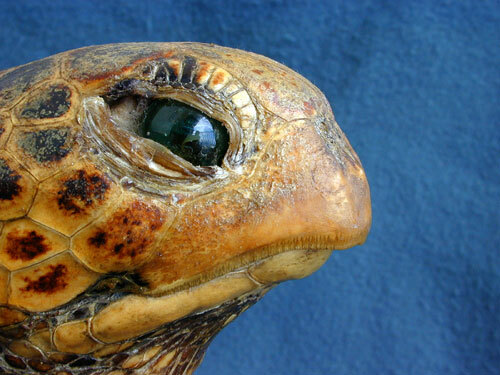 Turtles have a good sense of sight, smell, touch, and hearing. 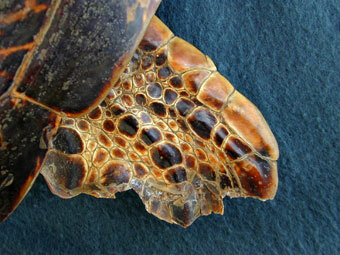 Turtle skin is partially covered with scales. The pattern of these scales (especially on the head) is different in each species and can be used in identification. Scales help protect the vulnerable parts of the turtle. 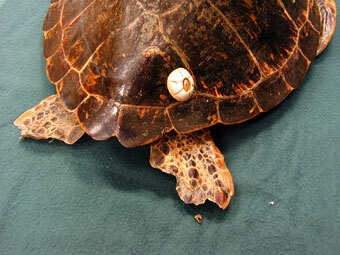 Turtles may have ectoparasites on their shell and skin. These ectoparasites do not harm the turtle, they are just hitching a ride (ecto means 'outside'). Barnacles often grow on turtle shells. 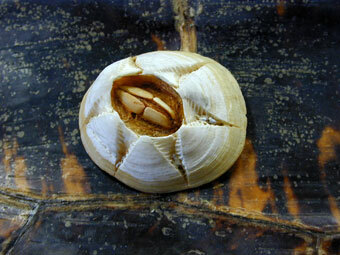 The barnacle shown above is Cheloniea testudinaria, a species found only on marine turtle shells. Crabs may be found hanging onto skin folds of marine turtles, especially around the tail. Male marine turtles have longer tails than the females. This characteristic can be used to tell the difference between the sexes of marine turtles. Each species also has particular sexual differences that may differ between the species.